How many hats do you wear on a given day? I’m willing to bet that you play a number of roles in your life and the lives of those around you. We all have various areas of our lives that require different things from us. Often those differing requirements can present some challenges when we’re working to take back control of our time. We need to acknowledge those and figure out a plan that will work with them, not against them. In yesterday’s introduction post I mentioned that building our time management foundation was going to be done one small step at a time. Today we’re diving right in and taking that first step – choosing where to start. Some people say getting started is the hardest part of any new project. I’m sure, that in many cases, they’re correct. I always find that the hardest part is figuring out where to start. When we’re talking about time management systems, this goes double. If you’re already feeling like you’re behind, picking that starting point can be really tough. It feels as though everything needs your attention right now. How can you get started when you don’t know where you should be starting from? It’s not as hard as it seems. All it takes is asking yourself some questions, and using your answers to guide you. When I find myself wondering where to start, sometimes taking a look at the roles I play can give me a really good idea of what area I need or want to work on first. Seeing the various roles I need to play helps me identify which areas require the most out of me and it allows me to take stock, and hopefully make an informed decision about where to go from there. Each of those roles require different things from me, but they’re all part of my Family life. what are my most important areas? do they need my attention or are they well under control? is there an area in my life that I know needs more of my time or that I would like to dedicate more of my time too? Knowing the answers to these questions can help you narrow down your focus. Maybe work is using up a lot of your time right now and you really want to spend more time with your family just enjoying being together – maybe family becomes your area of focus. I can’t tell you where to start, you need to choose for yourself. All I can do is share how I do it and guide you to the next step. To help get you thinking about the area you want to focus on I created the following worksheet for you to use. Tomorrow I’m going to show you how to take your answers and use them to take the next step. If you’re still not sure what area you want to focus on, consider filling printing out a worksheet for each area you’re trying to decide between. I know it’s tempting to think that you can easily tackle more one area, but picking ONE place to start is key to laying down the foundation for a successful time management system. Trust me, I fought this idea with everything in me when I started my journey. There are times when I still balk against the “one thing at time” mantra, but those are the times when I crash, burn and end up in the middle of a big ole mess. Remember what I said up near the beginning? You have to be willing to set yourself up for success! So, there’s your homework for today. 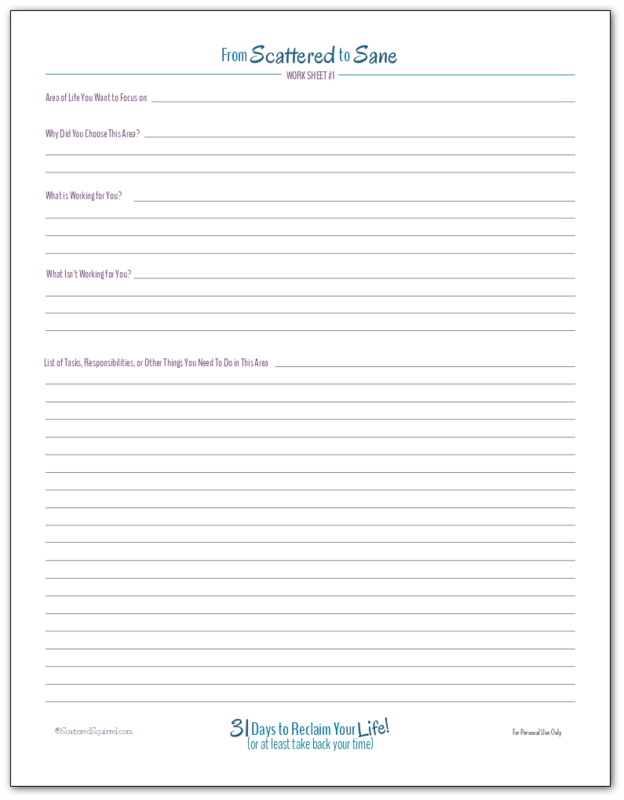 Grab a copy of the worksheet and spend some time thinking about what your life areas are and which one you want to start with. As always to snag your copy of any of the printables shared on Scattered Squirrel, simply click the pic! 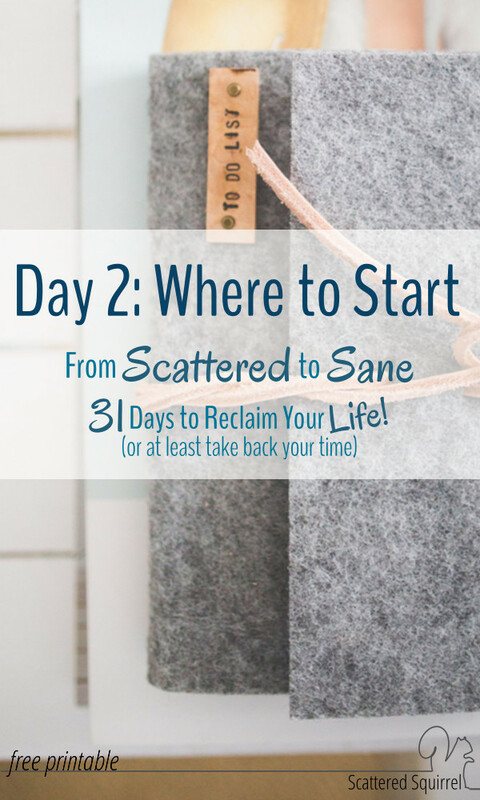 Tomorrow we’re going take the next step in reclaiming our lives (or at least our time), and I can’t wait to take it with you! Until then if you have any questions or want to chime in, drop me a line in the comments below. 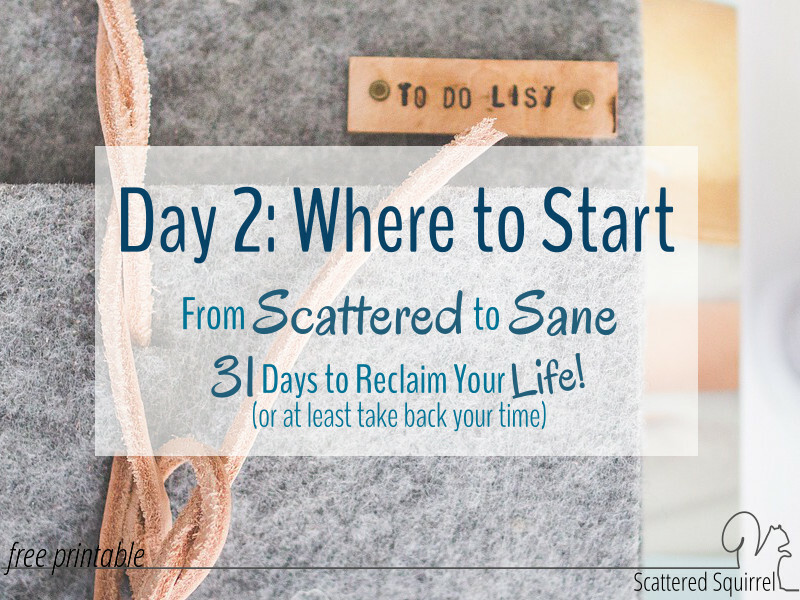 Previous Post: « From Scattered to Sane: 31 Days to Reclaim Your Life! One step at a time is SO important! It’s easy to think oh, this is going to be great, and then jump in and basically end up up to your eyeballs in stuff and entirely overwhelmed. I think in something like this, it would be doubly so. Picking one area of your life to put the focus on is more than enough – because you just can’t leave the rest of the areas to suffer (that would be counterproductive!). This printable is so useful. Although i’m not sure which area to focus on first lol I think I’m going to go with Home Management. I’m happy you think so Clare, I’ve found it to be helpful over the years, though this is the first time I’ve made it into a printable. It’s tough to pick just one area to focus on isn’t it? I always have to reign myself in and remind myself that if I try to do too much I’m not going to get anywhere. I’m so glad the timing was right for you. I hope you enjoy the series. This is something I’m currently working on! I will have to print this off, thank you! Anytime Lisa! It’s tough trying to balance all the things we need to do isn’t it? wow this is really difficult.every area seems to be crying out for help, the biggest thing on my mind this year is to create time for myself, self care and doing the things i love to do,that narrows it down tho . work and self. I’ll pick one of it to take me thru the 31 days. hmm will see. Am so so curious where this will lead. Choose one place to start can be hard. I had a hard time picking one area. My advice is to pick the area you really think needs a little extra attention and start there. You can always tackle the second one next. If you want my two cents, I’d start with self-care. You might be surprised by how making time for you can trickle goodness into all other areas of your life. I’m always here if you have any questions! … But I want to change everything NOW! 😭 Maybe that’s a reason I’m so scattered– trying to do everything at once?! It can be very tempting to try to change everything at once, but sometimes it can also be very overwhelming to try to tackle everything at once. I’m not an expert, this is just how I do it. You have to do what works best for you. It’s like you’re my twin, our minds work so much alike! So happy and excited that I found your blog! I’m a recent doctoral graduate who was used to working 60+ hours a week. Now that I’m down to working part-time, and being home with my daughter, I feel like my world has turned upside down! I find it HARDER managing a house and working part-time, than it was working 2 jobs! I’m currently working through each day slowly, and giving it a lot of thought. Sharing with my husband once I’m done. Bonus- he gets to see in writing just how much I try handle “behind the scenes” without him knowing! I found it very difficult to figure out just one thing to start, as I wasn’t even sure what to call different roles. Then I realized I was getting stuck on titles and finding just the “right” description. Once I let that go and went with whatever came to mind/sounded good, things started to flow! That’s awesome Emilie, that you were able to figure out what you were getting stuck on. Sometimes it’s the littlest things that hold us back. I wish you all the best as you find or create the systems that work best for you. I liked your method very much and I think it might work for me. So I have made up my mind to follow each and every step. I could narrow down my focus into one important thing but I really don’t know what works for me. I am stuck there. Finding what works for you is really a process of trial and error. Whenever I get stuck, I start with just one thing and try that until I know if it’s working or not working. It can feel overwhelming at times, but I keep reminding myself that some progress is better than none. You’ll figure out what works best for you! I have faith.